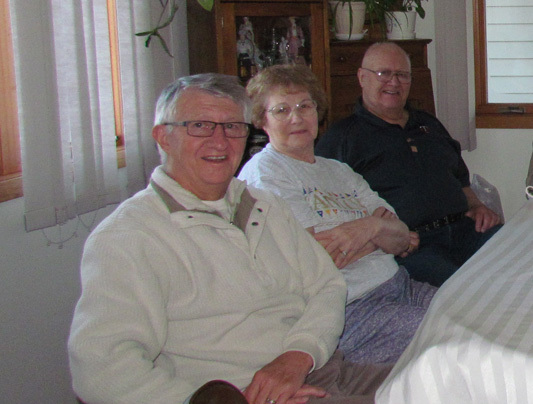 After spending another five wonderful months in Mexico, we flew from Guadalajara to California to catch up with Carmen, Mike, Dakota, Sierra and Hunter, and guess who was there--the whole family. 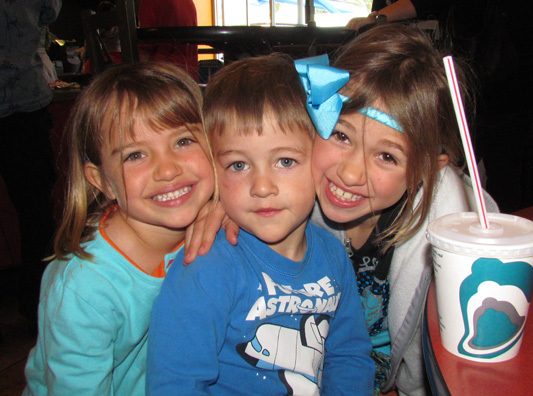 Denise, Craig, Clara and Chase spent their spring break in California. Here the girls are relaxing--a special moment with all those kids. Hunter and Chase both enjoy the things boys like best at this age, cars and trains. They even enjoyed smiling for the camera. 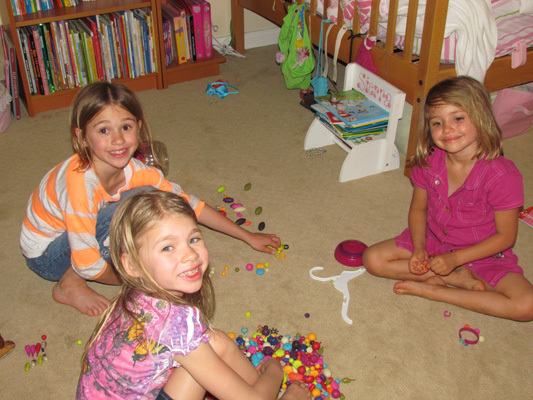 Dakota, Clara, and Sierra liked spending their time with dolls, jewelry, stones and other colorful things. 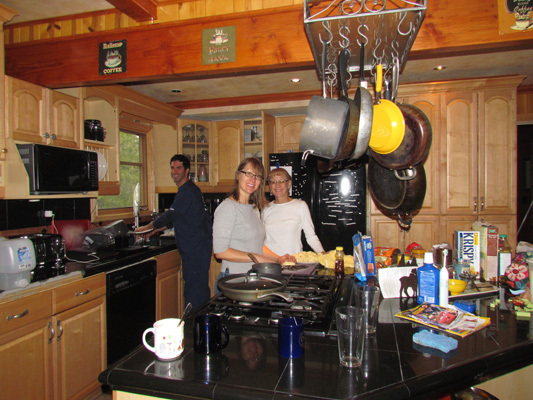 This kitchen is a part of a cabin Carmen rented near Big Bear Lake where we went from near sea level to a mile-high in the sky. The cabin was more of a house that could comfortably hold a dozen people. 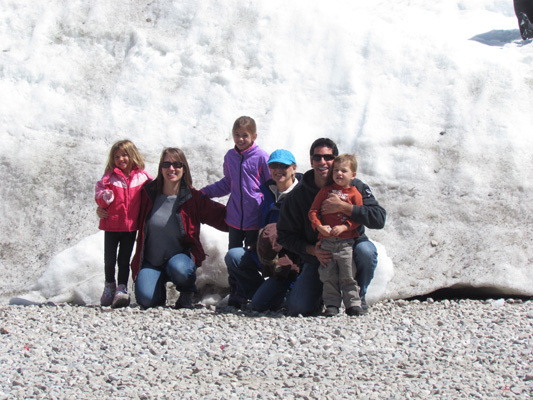 At this elevation, there is still snow to enjoy. It is just one of many things offered at Magic Mountain. 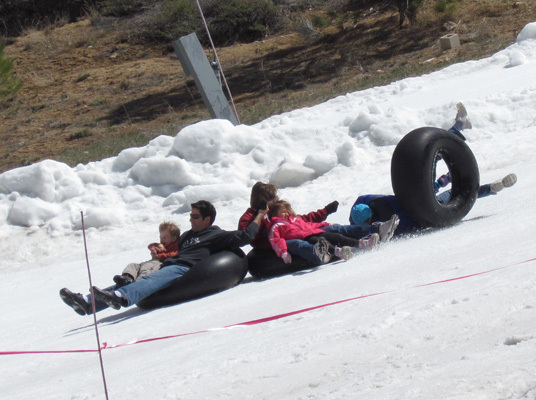 Here Glorine joined Carmen's family tubing. And this is what she gets for it. Hunter and Mike are in the lead, followed closely by Carmen and Dakota--Oops, Glorine and Sierra take a spill. Thank goodness, all is well. 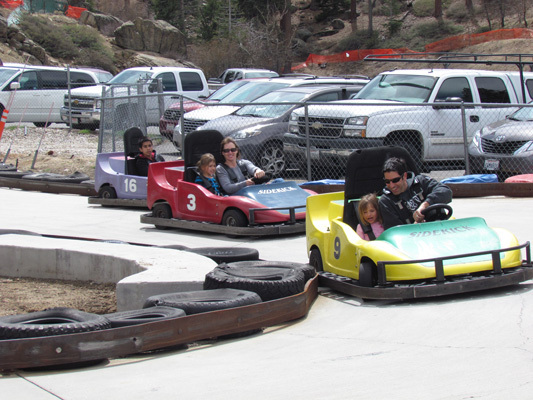 About one hundred yards from the snow run was this Go Cart Track. Here Mike and Sierra are in the lead, followed closely by Carmen and Dakota. Not in sights was Papa with Hunter fast asleep. That snow must have wiped him out. After a day of rest the crew were back at it, this time on skates. Papa and Hunter decided to sit this one out. Don't know who was enjoying it more, Dakota or Carmen. Mike and Sierra were wondering if this hour was ever going to end. 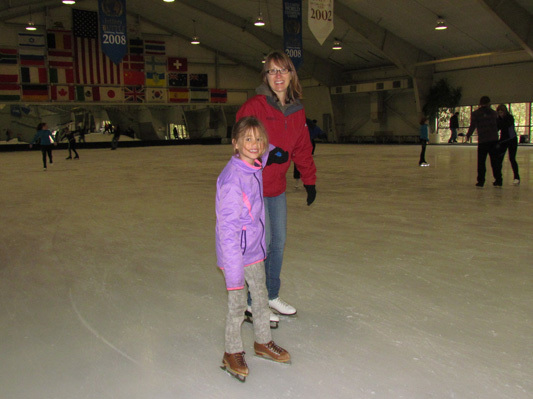 Mostly because they were being whizzed by skaters preparing for the Olympics. Here is a Hunter sandwich. Looks like the bread is enjoying it more than the meat!! For some reason people cannot resist these sheets of plywood with fancy paintings on then. 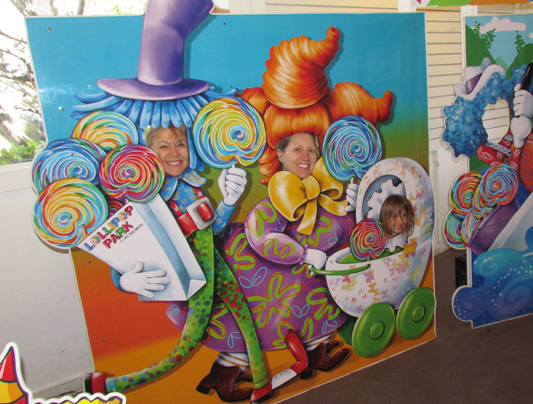 Now it is Nana, Carmen and Sierra's turn. Hunter just loves trains. Here he is the engineer with Sierra as his lone passenger over mile high bridges overlooking the ocean. 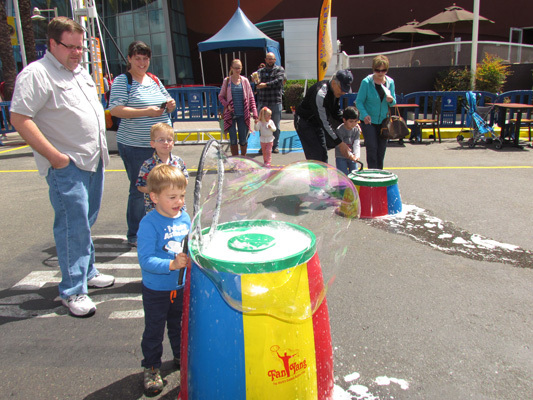 Back in Fullerton and the girls had their spring break and chose to take us to the Discovery Science Center which was showcasing Bubblefest. This guy was amazing by the size, quantity and color of all the bubbles he could make. Hunter loved the show and thought, maybe I can do this to. 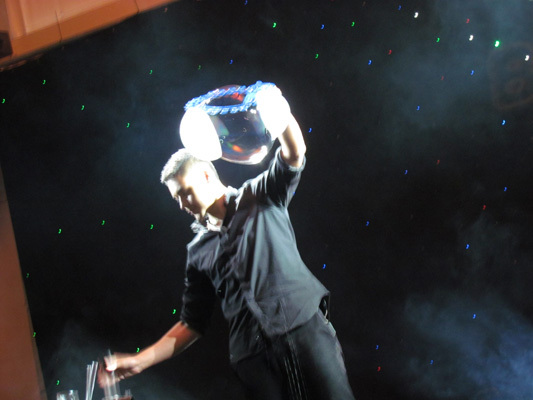 Here is one of his gigantic bubbles. 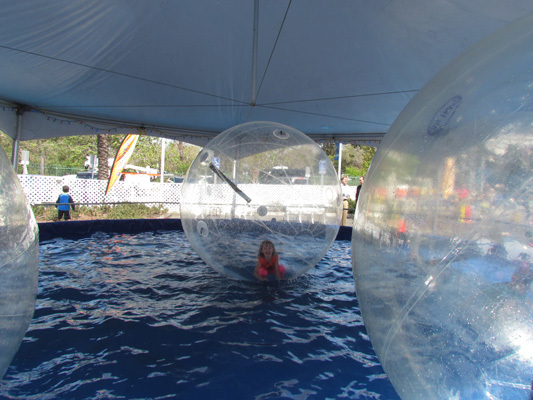 Sierra and Dakota thought it would be fun to float inside a bubble. It was fun but not too easy to walk in one. 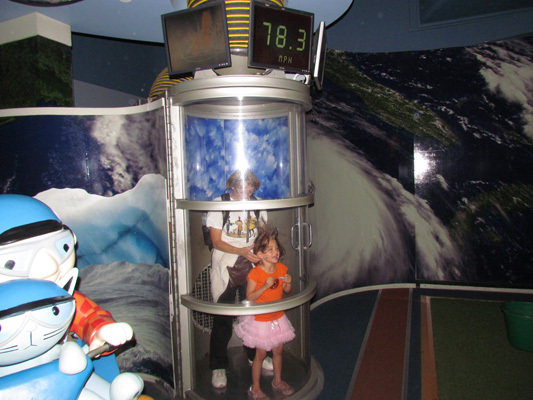 Inside the Science Museum, Nana and Sierra got to experience what wind felt like. With the wind chamber registering 78.3 miles per hour, Nana kept Sierra's hair from whipping her in the face. 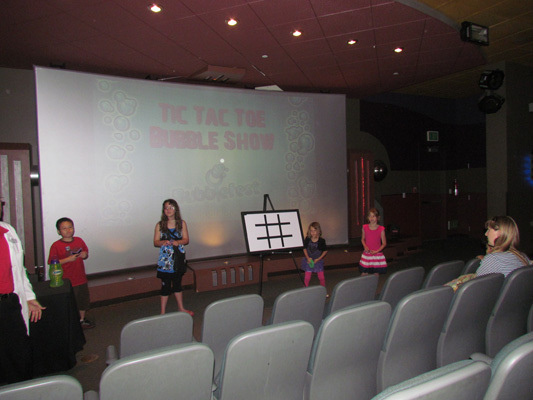 The following day we went back to the Discovery Science Center where Dakota and Sierra were selected to participate in a TIC TAC TOE BUBBLE SHOW. They tried, but in the end--they got their bubble popped. 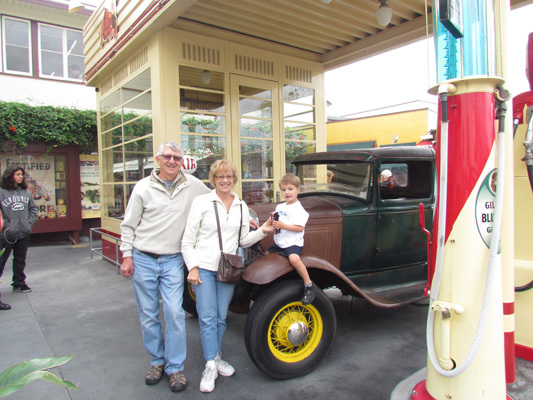 Carmen and Hunter took us to the Los Angeles Farmers Market that dates back to the 1930s. It has over one-hundred stands with nearly everything you could imagine. It was the first time for all of us and we were all amazed. 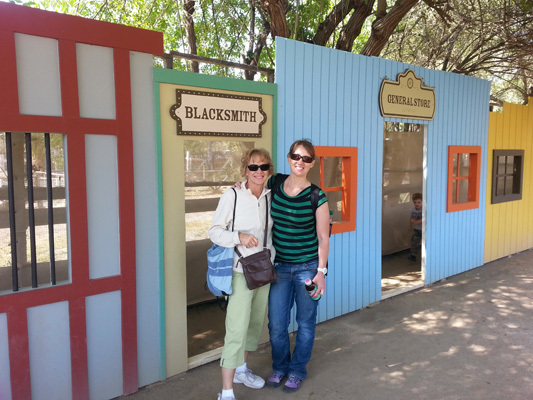 While the girls went to Catalina Island for a weekend outing with Mike and their YMCA Adventure guides, we took Hunter on a real train ride from Fullerton to San Juan Capistrano. 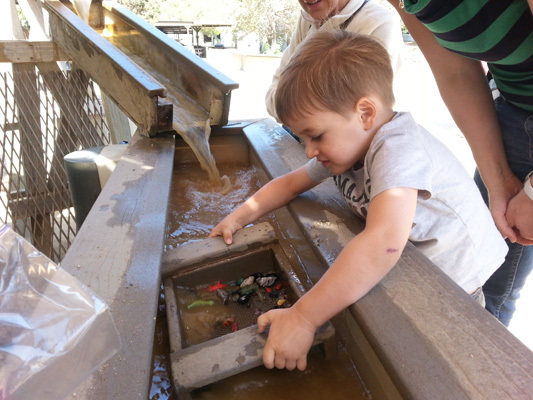 Here he is panning for gold and other treasures. 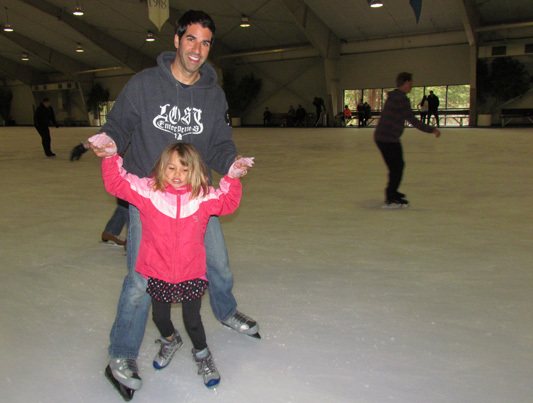 Ten days go by pretty quick when each day is filled with fun activities with the kids. It was also great to spend some quality time with Carmen and keep up with her successes as a professor of optometry. As we wound ourselves through the mountains and plains back to North Dakota, we took a slight detour to spend a couple of nights at the Tropicana in Laughlin, Nevada. 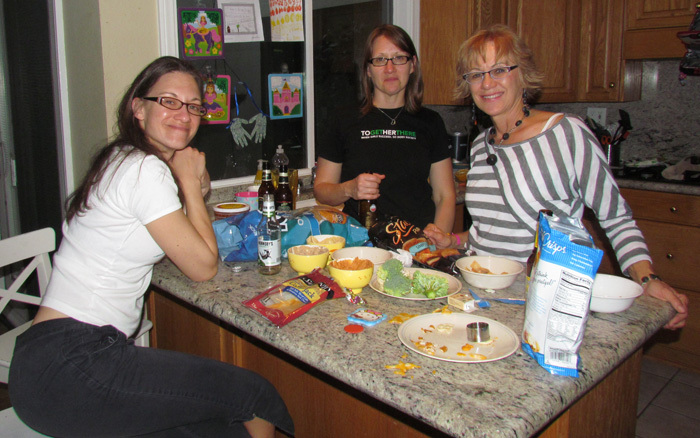 We met up with Claudia and Lou who were also returning home to their summer home. After two hard days of driving, we arrived at Lorraine's home in Dickinson. The roads were nice and dry all the way from California, but once we got to North Dakota we saw the remnants of an April snow storm that shut down schools and highways. 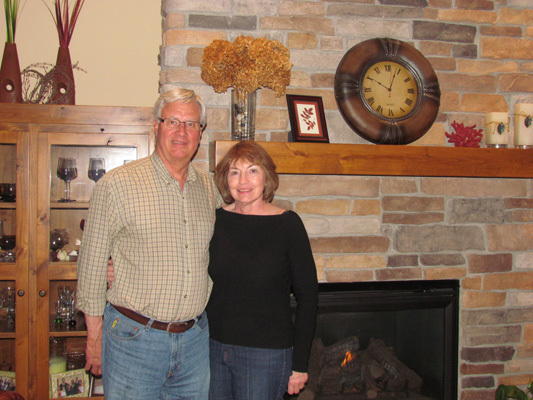 We got to catch up with Randy before he headed back to the oil field, where he has been working for the past ten years. 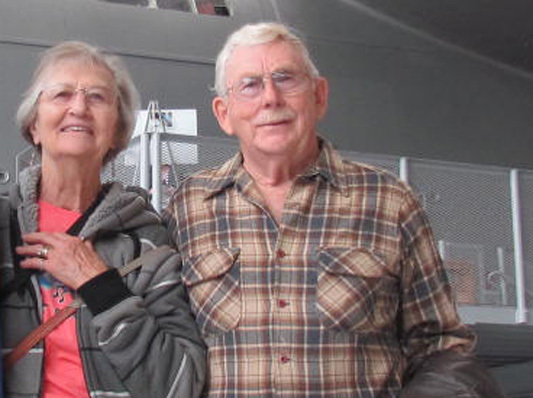 He and Marla are doing lots of work to their new home (the one Jack built back in 1967). Look'n Good! 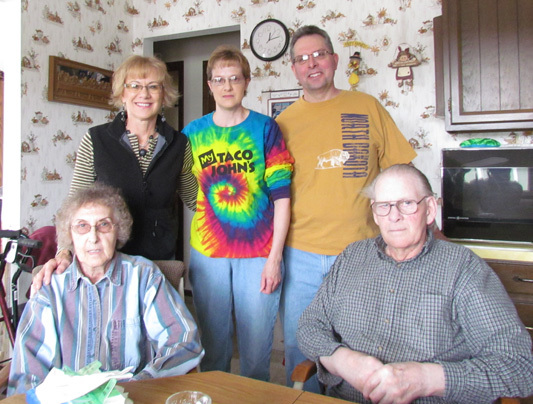 We stopped to visit Emanuel and Lorraine and their daughter Jodene and Mark in Mandan. 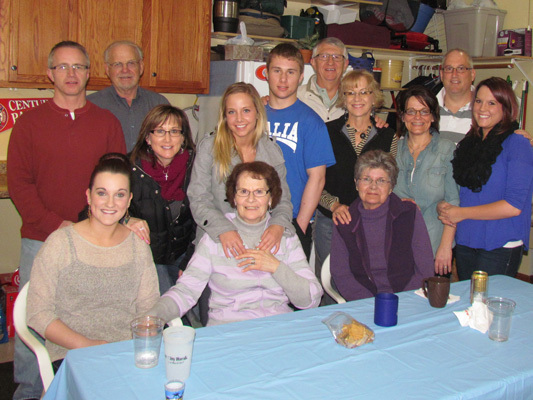 Dennis and Natalie (Marlene's son) hosted a family get together with his sister Lynn and Randy for Ray, Ida and us. 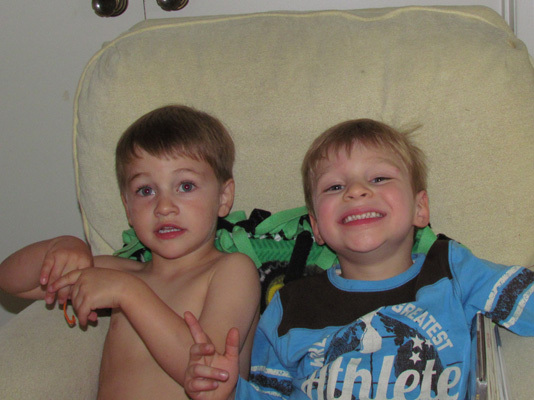 My are Marlene's grandkids growing! Ray and Ida took us to the State Heritage Center in Bismarck which was mostly closed for remodeling. 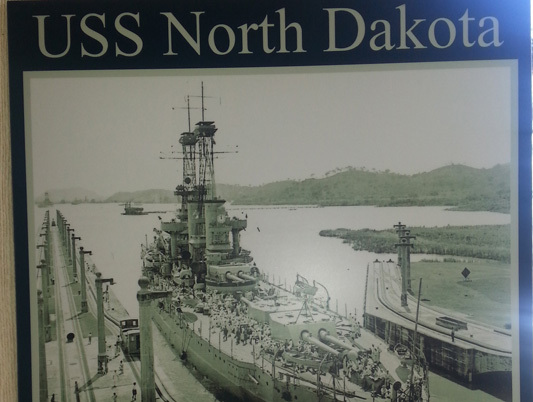 However we did discover that there was once a battle ship in honor of North Dakota commissioned in 1910 and spanned 20 years focused on peaceful missions. Donny Ressler, one of Glorine's cousins, owns an auto body repair shop between Bismarck and Mandan. In his spare time he takes down big game with either a bow or a fishing rod. Quite a nice collection. 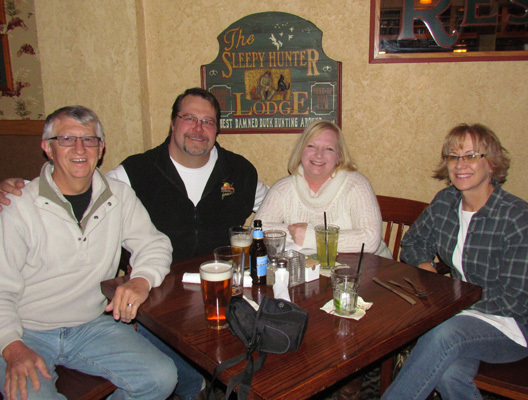 Dennis and Betty have become a big part of our lives over the past 30 years and a night out with them has become a part of our Bismarck rituals. 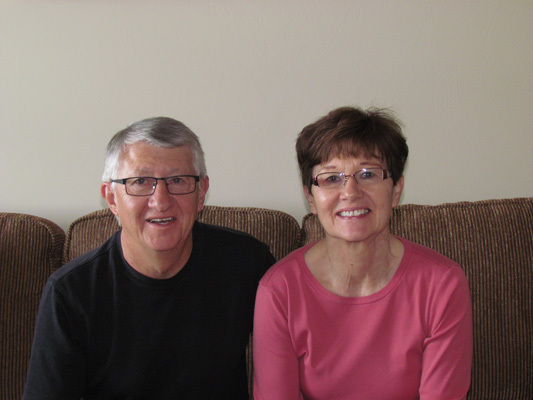 They are now grandparents to five beautiful kids and best of all, they all live in town. James spent his lunch break with us here at his Mom's place. 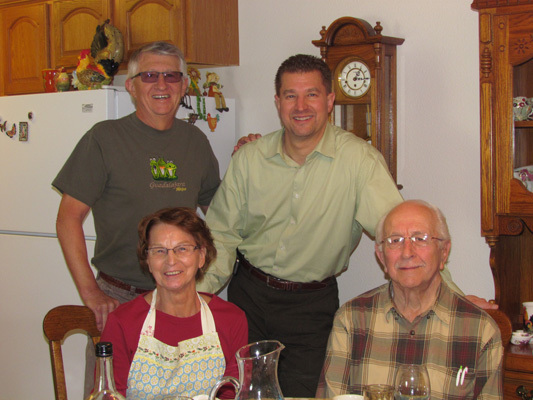 It was fun catching up with Gloria and Martin and hearing lots of stories about our daughters, from James perspective. Thank goodness they were all good. Two things we have come to count on when we are with Jack and Maryann and that is lots of good food and lots of cards, mostly Shanghai. Jack has found an interest in the Germans from Russia Society and the preservation of our rich ethnic heritage. 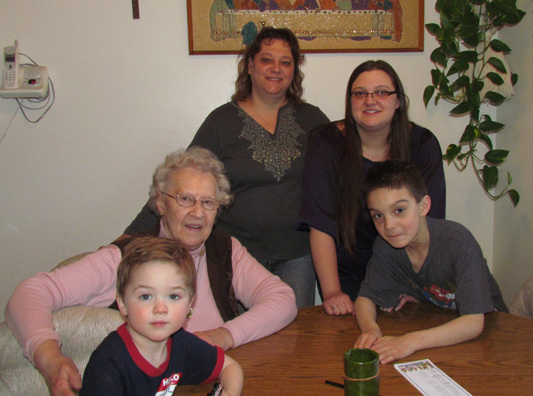 Getting four generations together is not uncommon at Lillian's home. After preparing a big meal for us, got her to pose with Lori, Amber Rose, and her two sons. Intergenerational living must be why Lillian keeps so young. 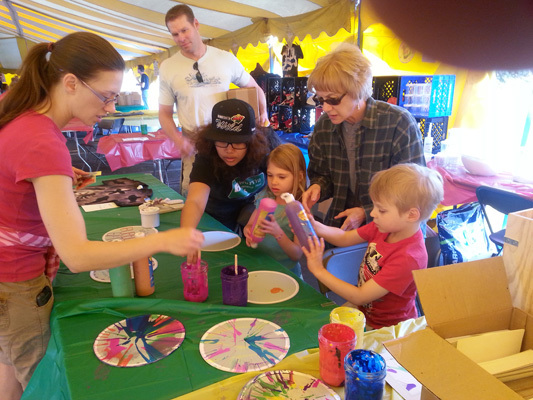 Once we arrived in Minnesota, we hit the road running with a week of activities starting with this carnival put on by St. Mark's Catholic Church. Clara and Chase didn't waste any time getting into the thick of the events. Who would have thought that this carnival was going to create an addition to the household. 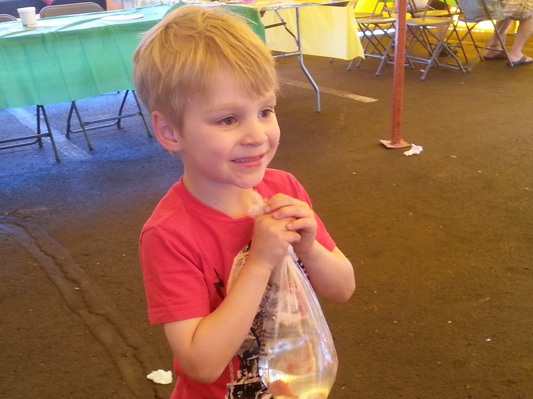 Chase bounced three ping pong balls into plastic bowls and walked away with two baby gold fish. It was a hoot getting them acclimated to an already busy home. 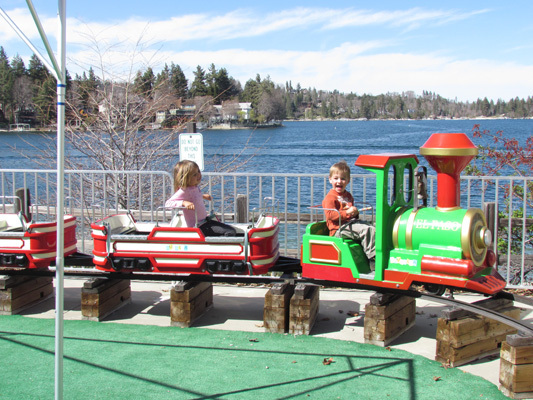 The April snows and cold weather didn't slow down these hardy Minnesotans. 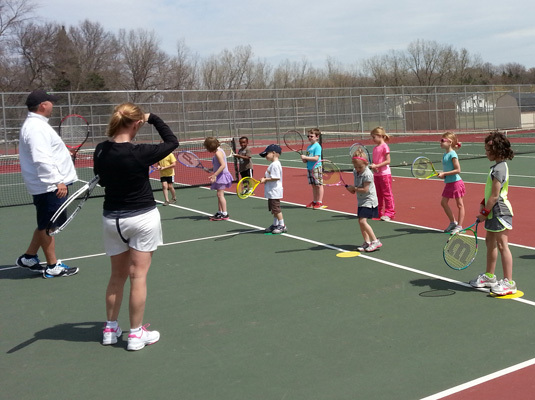 Clara and Chase are at their first day of tennis lessons. They mastered the first lesson of tennis, which is not to use the racket as swords. Hockey season is a big deal in Minnesota and as the season is coming to an end, Chase is still mastering his skating skills. 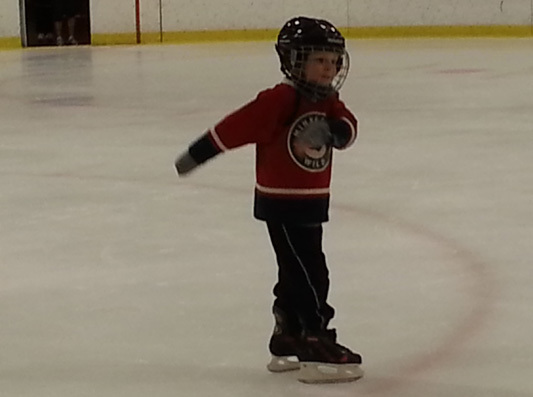 Here he is flying down the rink. And this with only two years of skating lessons. 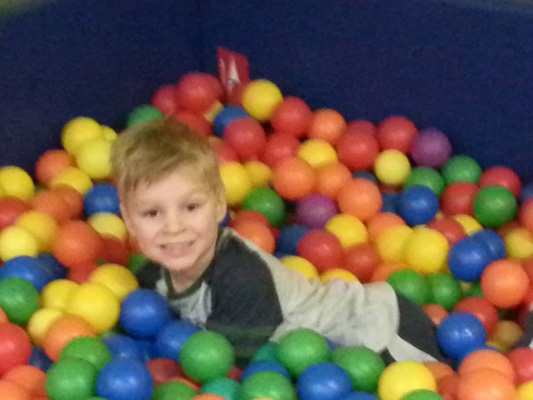 While Clara was attending a birthday party for one of her classmates, we got to spend some time with Chase. Isn't he a cutie? 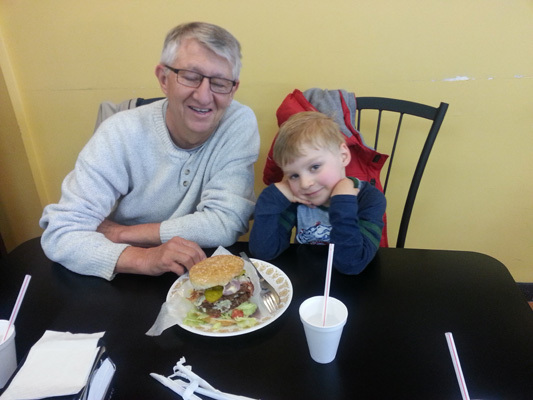 Chase is saying "OK Grandpa, let's see you eat that entire triple cheese bacon burger. But I will help with the bacon please." Lake living is fun, but brings with it a set of requirements. 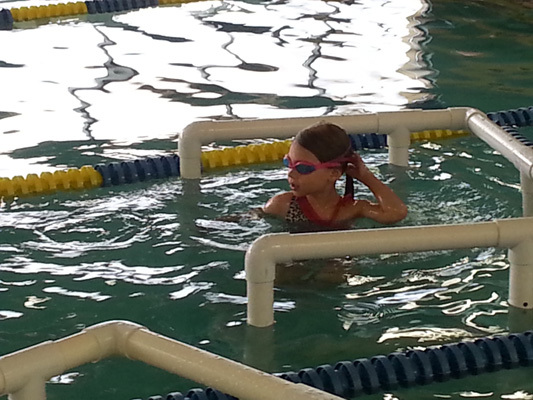 Swimming is one of them and at the rate she is going, Clara will not only master all the strokes but go on to the Olympics if she would like. 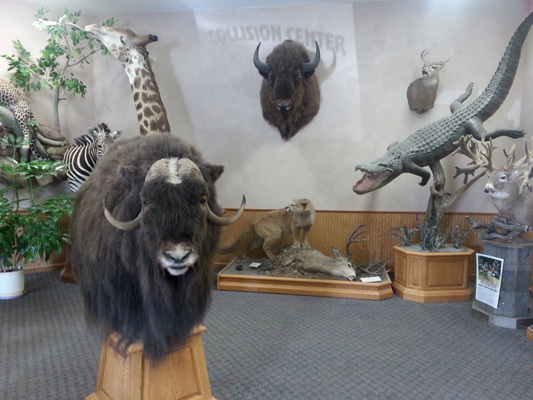 As we prepped the RV for our big road trip at a campground by Mystic Lake Casino, we were amazed at all the amenities offered by this reservation. This playground is an indoor child care center where we spent an evening with the kids. What is Grandpa doing way up there? 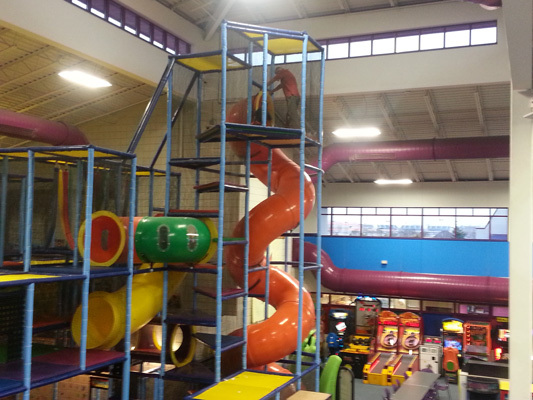 The slide was amazing!!! OK, we got the dock and the boat lift in and what happens? It snows some more. 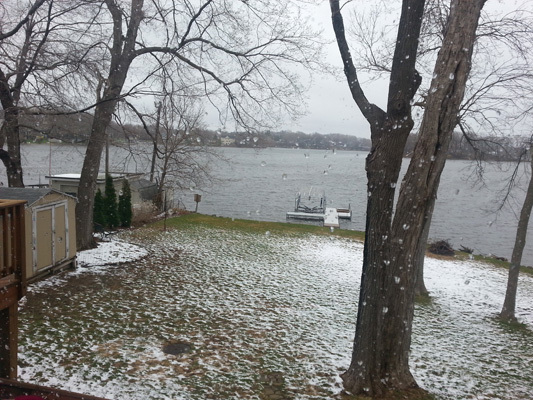 While the storm missed Prior Lake, parts of Minnesota got 18" setting a new record for the most snow in May. 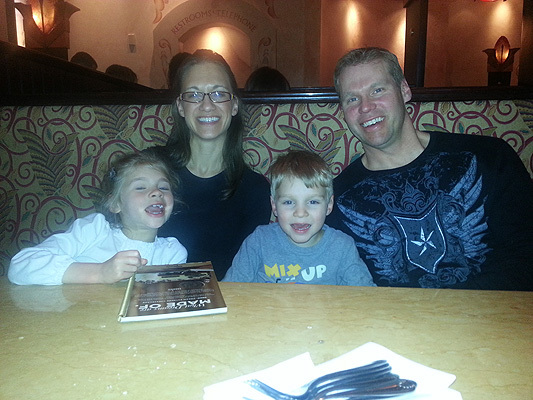 After spending time at Denise's work where she performed some procedures on our skin, we went to the Cheesecake Factory for dinner. Dessert is coming and wow do they like their desserts. We will be back in Minnesota in June.